Routine dental treatment generally consists of annual check-ups, tooth cleaning and simple fillings related to cavities or decay. Emergency treatments and minor surgeries are often included in Expat dental insurance plans. The dentition is completely checked first by dentist, and teeth present or missing is recorded. Cavities, broken fillings, crowns and other restorations on the teeth are checked. Mobility of the tooth is also assessed and recorded. In the examination of gums , the gingiva or the gum is inspected for its color, contour, consistency and it is probed to measure the depth of the pockets surrounding the tooth which is a sign of gingival disease. Any swelling or ulcer over the gums, if present, is recorded by dentist. The purpose of the soft tissue examination is to find out lesions, tumors (benign or malignant) or any other changes that are present in the oral tissues. It can be treated successfully by arun's dental arts chennai dentists, if we detect it in early stage itself. A soft tissue examination includes complete visual examination and palpation of tongue, cheeks, floor of the mouth, roof of the mouth, And also for the salivary glands. It also includes the examination of the head, neck, face and for the enlargement of lymph nodes by arun's dental arts chennai.. Cleaning : - the removal of stains and plaque by a qualified dentist. X-rays : - this expensive procedure is often performed by the dentist in order to see the teeth below the gum line. 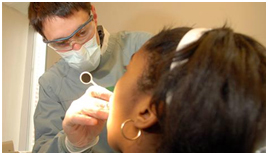 Tooth Extraction : - the removal of impacted or rotten teeth. Prescriptions : - any medicine prescribed by a dentist. Occlusion bar : - This is used to prevent the chewing surfaces at the back of the mouth becoming flat due to grinding of the teeth. Root Canal : - the nerve of the tooth is removed from the canal and replaced. Emergency dental treatment : - treatment received in a dental emergency room for the repair of damage caused in an accident. Local anesthesia : - contained to a specific area, relives the feeling of pain during an operation. Your dentist will recommend how often to have routine checkups. Many people should see their dentists once or twice a year. Your dentist will examine your teeth and gums for signs of tooth decay, gum disease, and other health problems. Your dental hygienist will begin to clean your teeth by scraping hard mineral buildup (tartar) off of your teeth with a small metal tool. Then the hygienist will floss your teeth, use a polishing compound, and apply fluoride. Cleanings usually aren't painful. Occasionally your dentist will want to take X-rays. The X-rays take only a few minutes. Your dentist or technician will have you bite down on a small piece of plastic. This will help align the teeth properly for the machine. Your dentist or technician will repeat this process several times to get pictures of all your teeth. If necessary, your dentist will put a sealant on the chewing surface of your back teeth to help prevent cavities. Sealants keep food and bacteria from getting stuck in the rough chewing surfaces or grooves of your teeth, and they protect your teeth from plaque. Your dentist or hygienist may apply a fluoride solution directly to your teeth to help prevent tooth decay. Your dentist may recommend a series of fluoride applications. If you are prone to infections, you may need to take antibiotics before you have any dental work. This includes those who: Have heart valve problems, which put you at risk for endocarditis. Have an impaired immune system. Had recent major surgeries or have man-made body parts, such as an artificial hip or heart valve. Your dentist or hygienist may ask you about the foods you eat. What you eat and whether you get enough vitamins and minerals can affect your dental health. If you have active tooth decay or gum disease, your dentist will talk to you about changing your brushing or flossing habits. In severe cases, he or she may recommend antibiotics or other dental treatments. If your teeth and gums appear healthy, your dentist will recommend that you continue your usual brushing and flossing.